"This Council congratulates Sulivan Primary School on the recognition received from both Boris Johnson, the London Mayor and David Laws MP, the Minister of State for Schools, in respect of the school’s excellent academic results. 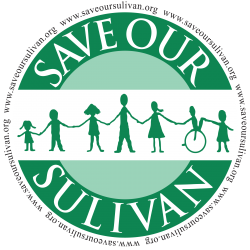 The Council supports the addition of a high quality secondary school in the south of the Borough but agrees that the excellent Sulivan Primary School should remain open and a new site found for the free school that does not involve cannibalising Sulivan Primary School". ﻿Cllr. Georgie Cooney (Con), the Cabinet Member for Education moved a wrecking amendment which changed the subject and removed any reference to agreeing "Sulivan Primary School should remain open". That was voted through by a majority of Conservative councillors. Then there was another vote on Sulivan Primary School. As reported, the Sulivan School closure has been called into the Borough's Education and Children's Services Select Committee. This is the first time a call-in has ever been issued in the history of H&F Council. But Conservative councillors decided to book the meeting at a highly unusual start time of 10.00am next Wednesday morning. To put that in perspective, no Select Committee meetings ever happen at 10.00am. They're always at 7.00pm so the public and councillors can easily attend. Now consider that that Administration broke with long-standing custom and practice and did not ask Opposition councillors or co-opted committee members if this time or date would be suitable. Instead, they just went ahead and announced it after, I am reliably informed, they had consulted with enough Conservative committee members to ensure the committee would be quorate. So it is evident that they are deliberately trying to make it difficult for the teachers, parents and governors to attend and are clearly trying and fix the vote by also making it hard for opposition councillors and co-opted committee members to attend and vote. The Chair of the School's governors formally complained. Her request to change the timing was clearly reasonable. My fellow Labour councillors called a vote and presented the wording below. "The Council notes with concern the email sent at 1.38pm today by the Chair of Governors, Sulivan Primary School to the Administration, which reads. ﻿The Council urges Cllr. Donald Johnson, (Con) the committee chair, Cllr. Tom Crofts (Con) , Cllr. Charlie Dewhirst (Con), Cllr. Belinda Donovan (Con), Cllr Harry Phibbs (Con), Cllr. Matt Thorley (Con) to work with opposition and co-opted members of the Education and Children’s Services Select Committee in recognising the reasonable nature of this request, to consult with governors of Sulivan Primary School and other stakeholders to agree a more suitable time and date for the issues raised in the call-in to be properly considered". ﻿The meeting finished late. Those members of the public that attended were very disappointed. Conservative councillors appeared uninterested in making any worthwhile points about Sulivan Primary School. Cllr. Helen Binmore (Con), the Cabinet Member for Children's Services didn't turn up despite being one of the people that engineered the closure. Many people complained that the Borough's Deputy Mayor Cllr. Adronie Alford (Con) was apparently engaged in embroidering a piece of cloth with what a member of the public identified as a picture of a cheetah. 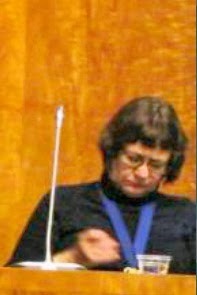 She was clearly uninterested in any of the facts presented about the school but voted with her Conservative colleagues on the school's future at every point throughout the evening. Meanwhile, here are some children from Sulivan Primary School singing "Save Our Sulivan". They deserve better than this. 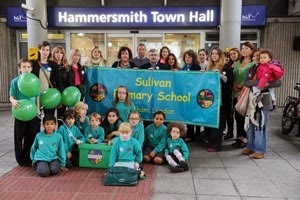 Unprecedented: Borough Select Committee Calls In Conservatives' Decision To Close Award Winning Sulivan Primary School. Last Monday’s decision by the Borough’s Conservative Cabinet to close the award winning Sulivan Primary School has been suspended after an unprecedented “call-in” issued on Friday by a majority on the Borough’s Education and Children’s Services Select Committee. All four independent co-opted voting members of the Select Committee joined with three Labour Opposition councillors to produce a majority of one. The controversial closure will now be reviewed at an emergency meeting. Why close a primary school whose latest SATs results place it as 233rd out of 16,884 primaries in England and put it firmly into the top 2% of schools in the country? Exactly what does this closure have to do with the proposed Fulham Boys School (FBS)? Sulivan Primary School has been set aside by the Conservative Administration as the site for the FBS. There was a well organised campaign during the statutory consultation on the closure of Sulivan Primary School to encourage people to write in and state their support for FBS. Conservative councillors agreed to count around 950 of those FBS statutory consultation responses amongst those they claimed were backing Sulivan’s closure in the report that was presented to the Borough's cabinet. Conservative councillors have taken legal advice: one on whether or not to publically declare a "friendship"; and two on whether to declare a “number of people they know” behind the FBS bid. They have been advised "this declaration is not a declaration of interests required under the code" and they have "no interest to declare". While nobody is suggesting anything improper has happened, we do now need to see a full list of all dates that elected representatives met with people behind FBS and discussed or referred to the bid or potential sites. It appears that the FBS proposals have absolutely everything to do with the proposed closure of Sulivan Primary School. It is also apparent that the pupils, teachers, parents and governors of other Borough schools could have faced the same calamity as those currently befalling Sulivan with every likelihood that the Conservative Administration would have put up other similarly spurious reasons for closing them. The Cabinet has not properly considered the school’s excellent performance. The Council have miscalculated the detrimental effect the closure will have on the children’s education. The Council effectively blocked attempts to increase the school’s numbers. The Council has misled the public during the consultation on the schools results, popularity and the reasons for its closure. The Cabinet has given undue consideration to the views, requirements and preferences of the founders of the Fulham Boys School. It would be unwise for the Conservative Administration to play down this call-in or try to bulldoze the process through. It would also be a huge concern and raise questions about their credibility if the six Conservative councillors on the Education and Children's Services Select Committee (one of whom is the Conservatives' newly selected prospective parliamentary candidate for Hammersmith) failed to properly take up their responsibilities to look into and act on these matters. Cllr Caroline Needham (Lab) the committee vice-chair, Cllr Elaine Chumnery (Lab) and Cllr Mercy Umeh (Lab). I was one of the people behind bringing the Hammersmith Academy to the Borough and I have been very impressed by the excellent West London Free School in Hammersmith. I think it is important to provide an additional, and high performing, secondary school in the south of the Borough but I do not believe this is any way to go about it. It is highly questionable that anyone should think turfing very young children out of the wonderful Sulivan Primary School, or any other high performing local school, is reasonable or sets a good moral example for young people of what is a decent way to behave. This Wednesday is the date of the next Full Council Meeting. It's a public meeting which you can attend and view the papers for it here. Sulivan's parents, teachers and governors have submitted questions to Conservative cabinet members which you can read from page 475, 476, 477 and 478. My Labour Opposition colleagues and I are calling for a vote on the school and you can read what we're proposing on page 536. It is ironic that the Conservatives', now suspended, decision to close Sulivan, was made almost a month to the day after the school received a letter of recognition by the Government's Minister of State for Schools. On 17th December he congratulated Sulivan Primary School on the “excellent performance of your pupils, particularly your disadvantaged pupils”. The Mayor of London also awarded Sulivan Primary School the Gold Club distinction, “recognising good work for disadvantaged pupils”. Those awards alone should have given food for thought. Now the Conservative cabinet have an opportunity to revisit their decision and do the right thing - which is keeping Sulivan Primary School open. Despite the public expectation that the Riverside Studios/Queens Wharf planning application had already been agreed by H&F’s Council leaders, there was still a palpable shock from the seventy or so strong audience, when all the Conservative councillors raised their hands in unison to formally give the go-ahead. The arguments for refusals and delay had been overwhelming. 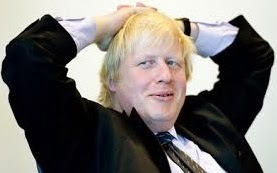 Now it falls to Mayor Boris Johnson (Con) to force a re-think. You can review the GLA's planning papers here. This is the team considering all aspects of the application. If you'd like to also raise your concerns directly with the Mayor you can email him here: mayor@london.gov.uk. This was just one of two of the Borough’s most important development schemes that went before a hastily arranged Special Planning Applications Committee (S-PAC) meeting just six days before Christmas. By 11.00pm there was still the BBC Television Centre application to start. I don’t think anyone seated around the Council Chamber believed the Conservative Administration's denials that they had insisted the Riverside Studios/Queens Wharf scheme was rushed through before the New Year in the hope that time would dull the memories of such a controversial approval long before May's local elections. The theatre and community arts facilities essential to the current Riverside Studios appear downgraded in the design. Instead, the media business interests of Riverside Television which also occupies the current site, appears to have been prioritised. While last minute changes had been made, planning officers admitted that negotiations were still on-going to deal with concerns about this. It obviously would have been better to conclude those negotiations to secure the community arts centre first, before granting planning permission and thus weakening the hand of H&F Council to strike the best deal. But that hasn't happened and many leading theatre luminaries are still not convinced. If H&F Council is not yet not confident it has protected Riverside Studios as a community arts centre, why allow Mount Anvil and A2 Dominion to duck out of their planning obligations to build homes “Londoners can afford”? In fact, the developers have been granted permission to build luxury investment units targeted at speculators in China, Russia and the Middle East. That contravenes both the London and Borough's own planning guidelines and is reason enough for the Mayor to now block this planning application. All but one of S-PAC’s Conservative councillors admitted they hadn’t read the “independent viability report”. I guess they felt they knew what it would say as its conclusions were much like every other such report produced for H&F Council, predictably saying it isn’t viable to build the homes they are obliged to do which “Londoners can afford”. So let’s consider what we know about this scheme. We know A2 Dominion had purchased Queens Wharf for the knock down price of just £12.8m. We know H&F Council owns the freehold for the Riverside Studios. A2 Dominion told me that it would cost them about £25m to build their original Queens Wharf scheme. So we have a good idea of what it will cost to build across the whole site. Consider that the previous owner of Queens Wharf had paid well over £30m for the site alone. Now consider how this planning permission spectacularly changes the value of the land at a stroke. It’s easy to understand how lucrative this project is for the business interests behind it and how badly the administration has negotiated on behalf of residents. Meanwhile, according to Nationwide, Hammersmith and Fulham has seen property price rises of 25% during the year ending 31st January 2013. That's the fastest rise in the UK but H&F Council's assessment was based on inadequate valuations carried out months ago, last summer. It is clearly possible to strike a much better deal that protects the arts centre and the neighbourhood. Officials admitted that the removal of the theatre entrance on Crisp Road and replacement with large garage doors including a delivery depot would damage that neighbourhood. Officials also admitted that it was likely that the newsagents, café and pub would lose business as footfall took alternative routes but said they hadn’t done any assessment of how badly those businesses would be affected. The same officials indicated that the extra height, particularly viewed from Chancellors Street would be worse than what is there at present. To counter this they unconvincingly argued that there was a precedent for sticking a large ugly building at the end of roads containing residential housing near the river. On 3rd August 2011 a senior planning official told the PAC that the Queens Wharf site viewed from Hammersmith Mall and the west of Hammersmith Bridge was “the Borough’s most sensitive site”. It was therefore very odd that two years later none of the photo reconstructions that were shown to the S-PAC contained any image from Hammersmith Mall. It also became apparent that there had been insufficient consideration of the heritage of the conservation area and the damage this scheme does to it particularly the aspects around Crisp Road and Chancellors Street. Residents alleged they had been told this had purposefully been left out to avoid spotlighting planning concerns. Officials denied this. The developers’ consultation and approach to residents appeared cynical and uninterested. They refused to come to meetings or answer the most fundamental questions and even consistently refused to respond to allegations that the Remarkable Group, their consultation advisor, had been investigating local residents who had objected to their scheme. Lord Richard Rogers, one of Britain’s world famous starchitects, joined critics of the design. Along with film director Sir Richard Eyre, actress Francesca Annis, architect Will Alsop and others, Lord Rogers wrote to The Times on the day of the S-PAC to say: “We believe that there has been insufficient consultation for such an important site, next to the Grade II listed Hammersmith Bridge, and on this rare riverside location, in a development in which arts facilities look likely to play a secondary role to privately-run TV studios.” They called for a “more informed and constructive discussion about the future of this important arts centre”. I think everybody wants a good scheme to be developed across the two sites. One that protects the Riverside Studios as a community arts facility, adds to rather than damages the immediate neighbourhood and is good value for residents. The only real deadline for planning permission is that Mount Anvil have a contract with A2 Dominion that says they need to have gained planning approval for their joint scheme otherwise A2 Dominion can go ahead and build the Queens Wharf scheme they already have permission for. The Queens Wharf scheme does not have any affordable housing in it. Instead, A2 Dominion have chosen to build luxury flats targeted at overseas investors. That is very peculiar because A2 Dominion are a housing association who are obliged to build and manage affordable homes. I believe we can get a better scheme agreed within any contracted deadline between A2 Dominion and Mount Anvil. But even if there are difficulties contracts an be re-negotiated and I find it hard to believe that any reputable housing association would push ahead with a its own project that not only ignores its responsibilities to tackle London's Housing Crisis but would kill any chance of maintaining a much loved community arts centre. Mayor Boris Johnson needs to block this scheme and force the developers and H&F Council to think again.